The Rowan Amber Mill have been quietly but steadily pursuing their own eerie ruralism and arcane take on psychedelia since 2008’s ‘Folk Devils and Moral Panics’, notably releasing the ‘Book of the Lost’ project with fellow traveller of these roads, Emily Jones, in 2014. This latter recording was an homage to such films as The Wicker Man, Witchfinder General, Blood On Satan’s Claw and Psychomania and ably constructed a soundtrack for an imaginary composite movie, replete with accompanying lobby cards and a suitable mythos. Aficionados of both modern day acid folk troubadours such as Sproatly Smith and Sharron Kraus as well as the haunted electronics of the Ghost Box label are strongly encouraged to wander not only the dark woods of ‘Harvest The Ears’, but also those of the Amber Mill’s back catalogue (a twisted folk version of Gary Numan’s ‘Are Friends Electric’ is one suggested highlight). 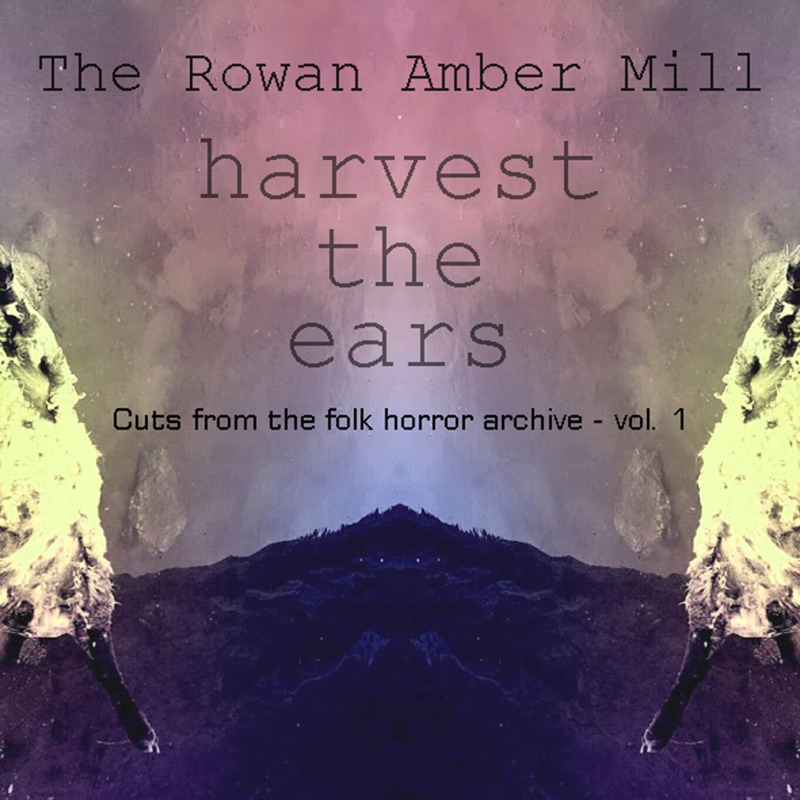 The Rowan Amber Mill’s most recent offering is a summing up and compilation of sorts, gathering new, unreleased and remastered songs together under the appropriate banner ‘Cuts From The Folk Horror Archive Vol 1’. The extended title track of the afore mentioned ‘Book Of The Lost’ opens the album, a Vincent Price styled narrator and a shimmering wash of harpsichord and vintage synth immediately creating an effective atmosphere somewhere between John Barry and Paul Ferris’ s essential score for Witchfinder General. The full length ‘The Book of The Lost’ is a master work and this lengthier version of a track cut from its parent album is no less essential. The melancholic beauty of ‘Separations’ follows, part electronic madrigal and part woodwind imbued lament; this is truly a folk song of the forest. Next, ‘The Witch Twists The Pins’ is a sinister nursery rhyme, echoed vocals framed by the darkest of psych folk to conjure an evocative and magical musical incantation. A highlight of an album filled with many such strong points, this would be worth the cost of admission alone but there is much, much more. ‘Face Of Flowers (Woodcut)’, from the genius ‘Heartwood’ album, utilises harmonised vocals, insistent acoustic guitar and spectral strings in manner that surely has Paul Giovanni nodding his agreement from above. ‘A Hunting’ glistens into being from a few stately harp notes, growing and layering with both analogue synths and waves of choral voices, creating a welcome sense of unease and beguiling nostalgia. This then segues into ‘Pit Of Horror’, a swirling and dramatic instrumental that surely would have been gracing the soundtrack to a 1970’s children’s TV show of a more pagan bent, such as ‘Children Of The Stones’ or ‘The Owl Service’, had it been of that age. ‘The Witch Twists The Pins’ agreeably returns in instrumental form, revealing hitherto hidden detail, until it leads into the final track ‘The Call Of The Black Meadow 1, 2 and 3 (Backing and FX)’. A track previously used on The Rowan Amber Mill’s promotional video for the ‘Songs From The Black Meadow’ album (inspired by Chris Lambert’s book ‘Tales From The Black Meadow’), this is a haunted house of a song, stripped back to effects and sounds redolent of Daphne Oram or The BBC Radiophonic Workshop with solar winds and ghostly electronics whispering in and out of focus to powerful and disturbing effect. And then it is over and the listener is left with an enduring and pleasant feeling of disquiet, appropriate given the folk horror nature of these compositions. This is an album then that belies its compilation or assorted collection status; it genuinely works as a piece in its own right and sits comfortably and confidently alongside the other Rowan Amber Mill recordings. Highly recommended to those who are keen on investigating the musical side of the folk horror revival, this is indeed a rich harvest for the ears. Time to gather the corn. Next postDiscount on all Wyrd Harvest Press Books.